Annual Potters Bowl held at the Shepherdstown Fire Hall. donated by local restaurants and community members. They get to choose and keep a special handcrafted bowl made by potters from as far away as South Carolina and as close as Shepherdstown. There is also our auction, featuring bidding on a variety of items including handcrafted creations, vacations, and jewelry. This is truly a community undertaking with local restaurants providing over 25 delicious soups for patrons to select from. 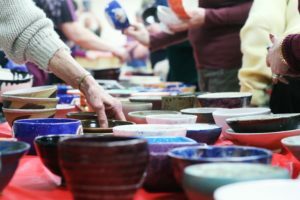 All proceeds from the Potters Bowl are used to fund the GSIVC programs that provide continuing assistance for the clients living in this community. The Potters Bowl Fundraiser is only made possible by the generosity of area potters, restaurants, donors, volunteers, and community members who attend and donate to this event. We offer you our sincerest thanks.